Floods and other natural or technological disasters harm human life and health, as well as infrastructure. Catastrophe management can prevent and minimize adverse effects. Affected people and foundations of life: Annually, 521 million people are exposed to floods, 344 million to tropical cyclones, 130 million to meteorological drought and 118 million to major earthquakes (i. e. [that is], above 5.5 on the Richter scale; Red Cross 2008, 144). Asia is affected the most. In 2007 economic losses by natural catastrophes totalled some US$ (United States dollar) 200 billion, including insured losses of US$ 45 billion (Munich Re 2008). Since the fifties, annual economic losses from natural catastrophes have increased tenfold (MA [Millennium Assessment] 2005, 9.). 113 000 lives were the average annual death toll of disasters with a natural or technological trigger from 1998 to 2007, varying between 23 200 and 252 000 (Red Cross 2008, 205). 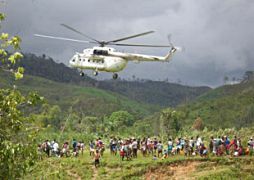 In 2008 more than 220 000 people died as a result of natural disasters, while at least 72 000 people were missing (major events were the cyclone Nargis and the Sichuan earthquake; Munich Re 2008). 850 000 to 4 million casualties were caused by the deadliest natural disaster in recorded history, the flood of the Huang He (Yellow river) in China in 1931 (NOAA [National Oceanic and Atmospheric Administration] 1999, Encyclopædia Britannica Online 2008, CBC [Canadian Broadcasting Corporation] 2008). This figure reflects the long-term risk of disasters. Including famines, there were much higher death tolls, up to 20-40 million people (CBC 2008). Targets/goals: There is no international target, but the UN has started the International Strategy for Disaster Reduction with the goal of reducing human, social, economic and environmental losses due to natural hazards and related technological and environmental disasters (www.UNISDR.org). Trend: − The frequency of disasters as well as their economic damages are increasing (Munich Re). The number of reported natural disasters has almost trebled from 1 110 during the 1970s, to 2 935 between 1993 and 2002. During the same period, the numbers of people affected by storms and floods increased from 740 million people to 2.5 billion. Similarly, the cost of the damage has increased five-fold to US$ 655 billion. However, the numbers of people who were killed by natural disasters fell from 1.96 million during the 1970s to 531 000 between 1993 and 2002. (Christian Aid 2006, 7.) In Bangladesh, for example, the death toll due to high intensity cyclones and flooding was 240 000 lives in 1970. With emergency preparedness and multisectoral risk reduction programmes, the death toll of comparable or even more severe storms was reduced to 138 000 lives in 1991 and 4 500 lives in 2007. (WHO [World Health Organization] 2008, 65.) However, in the current decade, the global death toll has increased significantly (Red Cross 2001 and 2008, 205). Measures: The UN (United Nations) International Strategy for Disaster Reduction has developed a Framework for Action 2005-2015, which is concerned with e. g. (for example) early warning systems and the risks of climate change (UNISDR.org). Munich Re Group 2008: Catastrophe figures for 2008 confirm that climate agreement is urgently needed. Press release, 29 December 2008. Red Cross 2001 – International Federation of Red Cross and Red Crescent Societies: World Disasters Report 2001; Chapter 8 - summary; Disaster data: key trends and statistics. Red Cross 2008 – International Federation of Red Cross and Red Crescent Societies: World Disasters Report 2008; Focus on HIV and AIDS. WHO 2008 – World Health Organization: The World Health Report 2008; Primary Health Care; Now More Than Ever. Geneva, 2008.